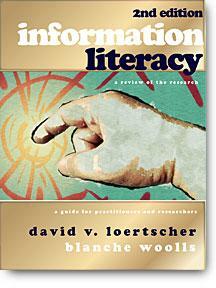 The last major review of research on information literacy for school library media specialists was done by Christina Doyle in her 1994 monograph from ERIC titled Information Literacy in an Information Society. Now, the two authors have updated this critical area updating the Doyle work through 1997. Studies published in research journals, research retreats, both in the school library media field and in the larger field of education are included. The volume also includes studies done not only in th U.S. but in Canada, Australia, and in Great Britain. The authors not only review the research but offer numerous suggestions for translating that research into practice as school library media specialists educating young people. Designed for the serious practitioner and the researcher who wants to stay current. David V. Loertscher and Blanche Woolls Hi Willow Research and Publishing; 2002 "